The Samsung Galaxy Note 3 comes in a more refined finish than last year's Note. The edges are more rectangular while the body has almost entirely lost its gloss and has gone for a soft-touch, almost rubberized finish that emulates leather glance suggesting the Note 3 is a digital moleskine of sorts. Compared to the Galaxy Note II the Note 3 has slimmed down and the height and width of the device is virtually the same, despite the screen size increase. It also helps that the new Note 3 is over a millimeter thinner than the previous Note (8.3mm vs. 9.4mm) and it's lighter too - 168g (down from 183g). We've handled phones that weigh more than this. The plastic around the screen is matte and has a brushed metal texture to it and comes in the standard Jet Black, Classic White and Blush Pink colors (don't worry, if you want more hues there are a ton of back covers). All of the Note 3 is plastic even if most of it doesn't feel like it. The sides have what looks like a grooved metal strip, but that's plastic too. The grooves are not only an attractive design element, but they also positively improve the hand grip. Above the 5.7" display you'll find the earpiece, a 2 MP front-facing camera capable of 1080p video recording, the proximity sensor, ambient light sensor and the motion sensor, which is responsible for all the air gestures (aside from the Quick Glance overview, which relies on the proximity sensor). Under the display we find the typical Samsung three button layout consisting of a physical home button and a back and menu side buttons, which are capacitive. As usual the home button has an aluminum accent that surrounds it and adds a nice classy look. The sides of the Galaxy Note 3 are nothing out of the ordinary in terms of controls. There's the rudimentary power unlock button on the right hand side on which the thumb nicely rests and the volume rocker on the left. The volume rocker could have been lowered a little bit so as to be more easily accessible. The Galaxy Note 3 is the first mobile device to feature USB 3.0 using the micro version of the port. The connection consists of two parts - one that is backwards compatible with microUSB 2.0 and one that adds additional pins for faster data transfers. Also at the bottom is one of the mics, the loudspeaker grille and the S Pen housing. The top features another mic and the 3.5mm audio jack, plus the IR blaster that Samsung has been putting on some Galaxy devices this generation. The left side features the volume rocker and the right the power button with yet another mic. The S Pen can be placed back into its holster in two ways - either top or bottom facing up but you can't quite insert it any way you like as Samsung claims. Then we get to the back, which (and we're not exaggerating here) is a massive improvement over the Note II back. With the Galaxy Note 3, Samsung has stuck to using plastic again, but this time around it has a great-looking leather texture. Best of all it feels similar to actual leather rather than a tacky imitation, and the faux-stitching is a great touch, too. Another thing we like about the leather texture is that unlike the glossy hyperglazed plastic, it doesn't become a smudgy, slippery mess as soon as you touch the device. We hope Samsung releases such covers for the Galaxy S4 as well. You can pop off the back cover to reveal the 3,200mAh battery (we were hoping for a bigger bump in capacity) along with the microSIM and microSD card slots. The slots are stacked on top of each other like they were on the Galaxy Mega 6.3. The bottom slot holds the microSIM card, which is blocked by the battery, while the top slot is for the microSD card, which can be removed even with the battery in place. The Note 3 comes in 32GB and 64GB versions, but with a microSD card slot we doubt many people will go for the 64GB option. The retail package consists of a microUSB 3.0 cable, a 2A A/C adapter and a 3.5 mm headphone set with volume controls and microphone. The box comes in a wooden-style finish just like the Galaxy S4. The Samsung Galaxy Note 3 feels big in the hand but by no means too big or too heavy. If you're using a Note II (or even an original Note) you won't bat an eye at the size of the Note 3. It feels sturdy and well put-together despite its primarily plastic build. Sure, one handed operation is almost impossible for people with small hands but for regular phablet users the Note 3 is just the right amount of big. Samsung has done a nice update to the S Pen as well, making it usable with the capacitive buttons so now you can navigate the Galaxy Note 3 simply using the stylus. The display of the Samsung Galaxy Note 3 is the highlight feature alongside the S-pen support. So let's cover the technicalities - the diagonal has been bumped by 0.2" (from 5.5" to 5.7"), while the resolution is more than twice as high (1080 x 1920 vs 720 x 1280) resulting in a pixel density of 386 ppi, which effectively (for the first time in Note terms) passes the Retina 300 ppi threshold. The display technology is, again, Super AMOLED but this time the matrix isn't RGB but PenTile, however at these insane ppi levels there's no visible pixelation whatsoever. 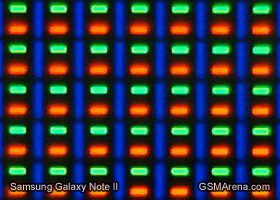 The previous Note featured an RGB Super AMOLED display, meaning that the pixel arrangement featured the right amount of red, green and blue pixels. 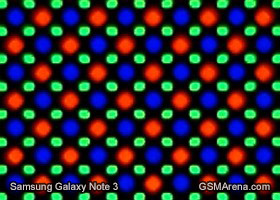 Being PenTile, the Note 3 has a pixel arrangement matching the one of the Samsung Galaxy S4 - green sub-pixels are twice as many as blue and red sub-pixels, which isn't going to be relevant unless you have a microscope on you. Which is exactly what we have here. The screen on the Samsung Galaxy Note 3 is among the best we've seen here at HQ. It has practically infinite contrast, impeccable viewing angles and colors that pop out of the frame like nothing else. Samsung has even made sure the wallpapers in place are able to accentuate the color saturation to the extreme, but we like it. Despite the excellent LCDs on top tier smartphones these days it's tough to match the Super AMOLED's amazing image representation and deep blacks. The innate lower reflectivity of the AMOLED panel reflects in better sunlight legibility but more on that a little later. First off, let's look at the numbers. The Samsung Galaxy Note 3, as we said, has a practically unlimited contrast ratio, since blacks are naturally deep and don't require individual pixels to light up - AMOLEDs light up only the parts of the screen that require any color beside black. The Super AMOLED panel on the Galaxy Note 3 isn't the brightest we've seen and it's inferior to the Galaxy S4 in this department. However in most cases you won't notice this in practice unless you pit the Note 3 side by side with an HTC One or iPhone 5. The numbers of the Note 3 are also consistent with its predecessor. Under direct sunlight the Galaxy Note 3 is able to retain excellent contrast and stay legible even in the most highly lit environments. 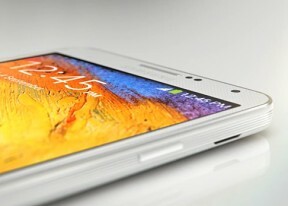 The Galaxy Note 3 was able to match the Apple iPhone 5 and retain the third spot.